This DANIEL SMITH exclusive is a favourite of artists. It moves from a deep dark turquoise to a thin film of robin's egg blue in a single wash, making a remarkable transition from ground level to sky areas of garden floral. 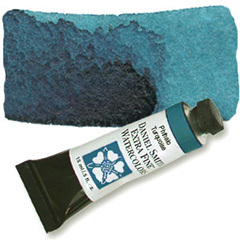 Use Phthalo Turquoise alongside purples, or to paint a lake in summer.